Lichtenheld’s illustrations are the realized potential of every box of crayons you ever opened as a child – saturated in rich color, detailed in content and full of energy. His puns and other forms of humor are right up my alley – the wittiest children’s author around as far as I’m concerned. As for alliteration, Eloise just can’t resist the fun of repeating the double B’s in this book’s title. 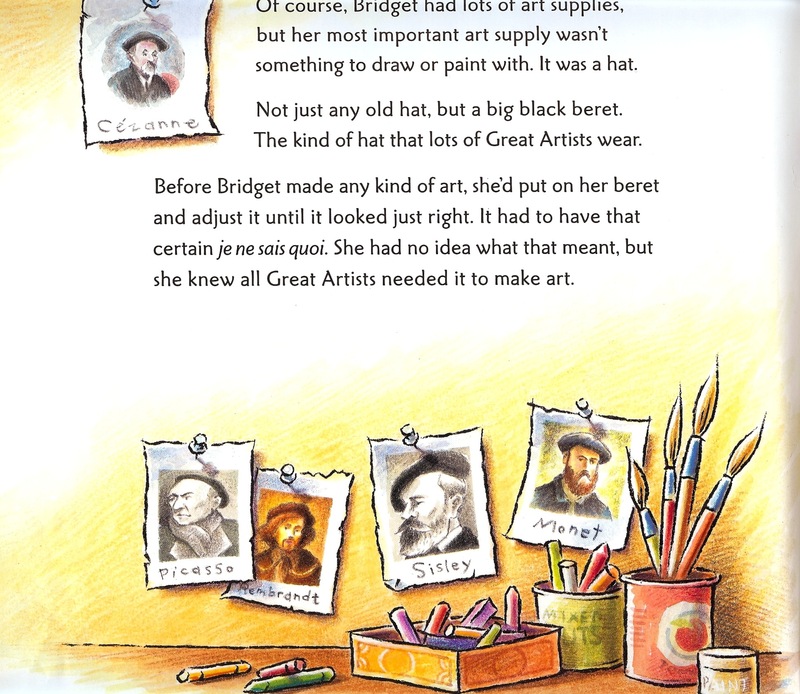 “Bridget’s Beret” chronicles the journey of Bridget, a talented young artist whose cherished black beret is blown away – mid brushstroke – by the wind one day. She searches high and low for the beloved chapeau but to no avail. And without it, she fears she’s lost her ability to draw. 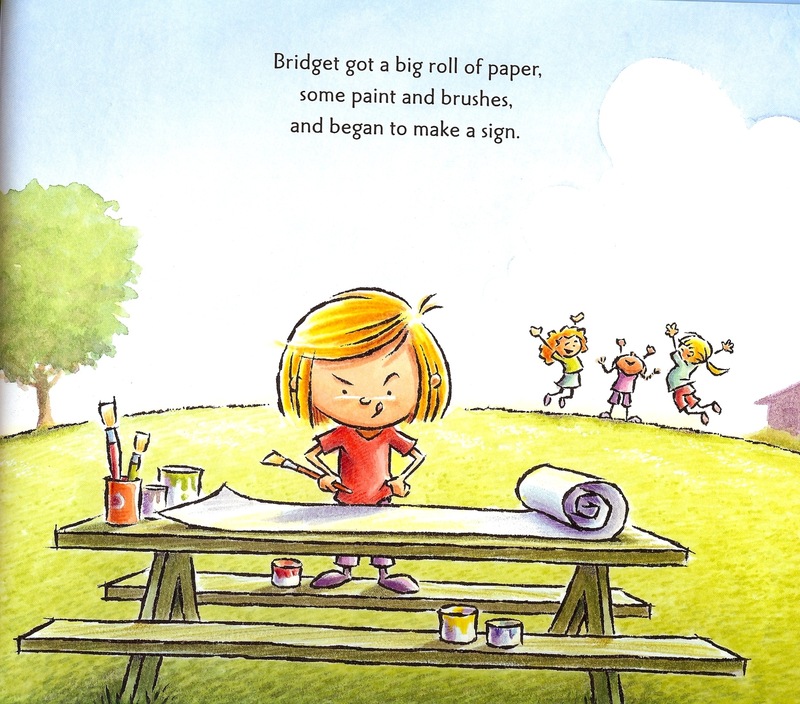 After several days of moping, Bridget reluctantly agrees to make a sign for her sister’s lemonade stand but grumpily warns: “No drawing.” Once she has paint and brush in hand, however, Bridget finds there’s no containing her artistic inspiration. 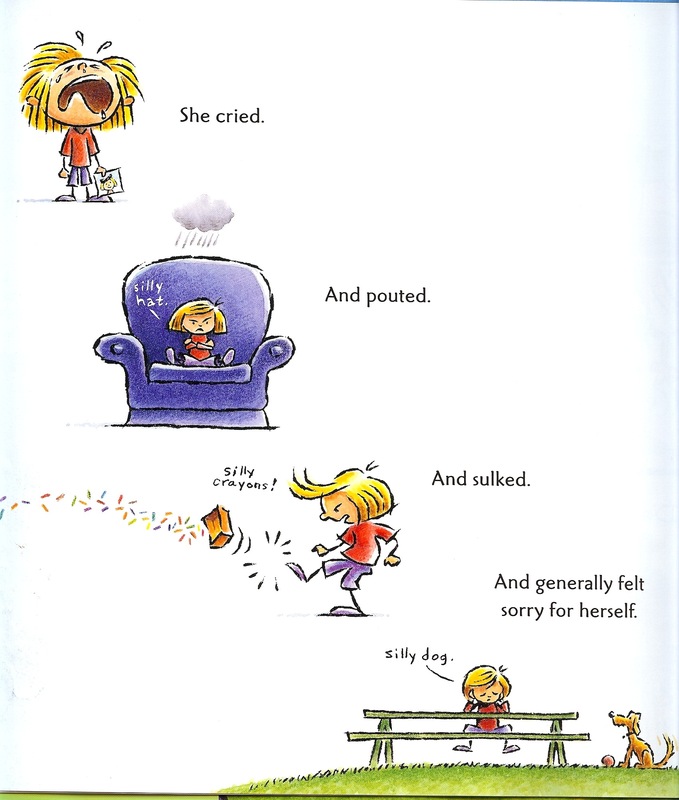 The result was “Bridget’s Beret,” Lichtenheld’s first book aimed at a female audience. Previous books, including “Everything I Know About Pirates,” slanted more toward to interests of his peg-leg and eyepatch-obsessed nephew, Adam. 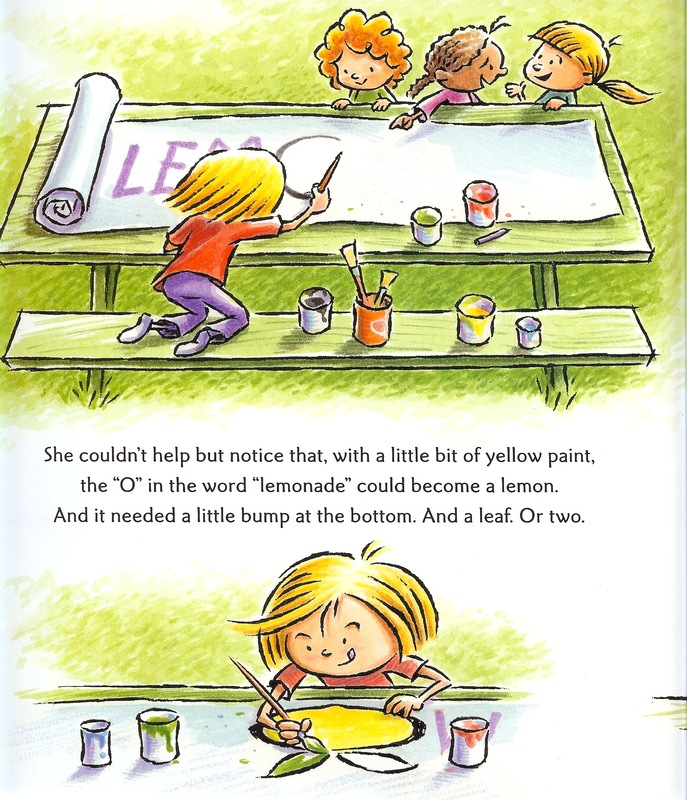 With “Bridget’s Beret,” however, Lichtenheld was certain to make his protagonist a “girl of substance beyond her appearance.” What I admire about Bridget are her looks of determination, air of confidence and the fact that she takes herself and her art seriously. Prior to “Bridget’s Beret,” Lichtenheld wrote books he refers to as “encyclopedias of silliness,” or books lacking a traditional narrative with a plot, hero and moral. “What Are You So Grumpy About?,” the other Lichtenheld title in our home library, certainly qualifies in this category. Every square inch of this book is sheer goofiness, from the endpapers to tiny details in the illustrations to the author’s biography on the dust jacket. See the concrete smirking? Admit it, you blame the sidewalk, too. Many of these hilarious spreads were sketched before Lichtenheld even deplaned. On his website, he offers an amazing behind-the scenes look at how he turned these quick sketches into finished illustrations. Using his pencil drawings, Lichtenheld creates black line art, which he prints on watercolor paper. “It’s kind of like a home-made coloring book,” he says.” He then layers watercolor paints and colored pencil to achieve the finished product. Bridget’s Beret is one of our very favorites now, thanks to you! It is so clever, and August, even though he’s a boy, asks for it over and over!! I love the descriptions of the paintings in the back! Thank you for your kind, thoughtful, comments about my work. Your review of Bridget gets at the heart of what I was trying to communicate; that art and creativity are irrepressible. My mom got Ayden “What Are You So Grumpy About?” for V-Day and he loves it! We’ve read it at least 50 times today already.